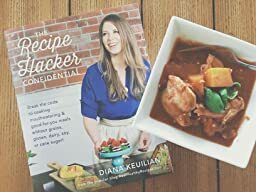 The Recipe Hacker Confidential is the cookbook I have been longing for. I have really great intentions of cooking healthier meals for myself and my family but I tend to get stuck in a rut. So if you started the new year wanting a new way of cooking - well here you go. This is the cookbook you have been waiting for too. Now you have zero excuses for cooking healthy foods. Too expensive? Not these recipes. Too difficult to make? These recipes are basically what you're making already just tweaked to be more healthy. Do you think your kids (or husband) would never eat healthy food. I think you will find something they/he'd eat in here. Three ingredient pancakes. chocolate chip muffins, breakfast pizza. Stuff to make ahead, stuff to whip up in a couple of minutes. This is not the most beautiful cookbook you have ever held in your hands but it does feel like sitting with your food-smart girlfriend and having her hand over all of her best and most favorite recipes. I received a digital copy of this cookbook for the purpose of review from NetGalley.com. Links in this post are affiliate links. Thank you for supporting my blog!